Well, I think it’s high time for a salad, don’t you? 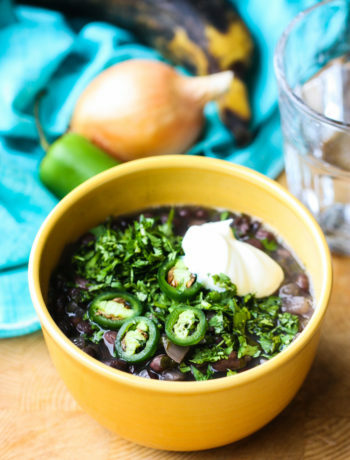 This isn’t really a “recipe” per-say, but it’s my number one lunch that I probably eat four times a week and for quick late dinners after yoga. I love the combination of flavors and the way it actually fills me up, rather than those other sissy salads comprised of simply lettuce and carrots that leave me starving ten minutes later. This is sort of a different type of recipe post, but I promise I’ll be back in full force soon. I’m currently traveling around in East Texas with limited access (if any) to the Internet and soaking up time with family and friends. Thanks for understanding! 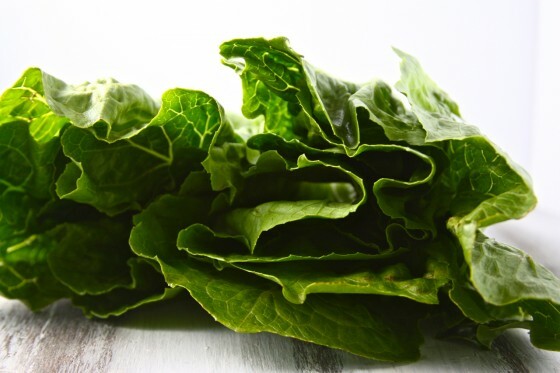 So first, you take some romaine. I use one head for one salad. 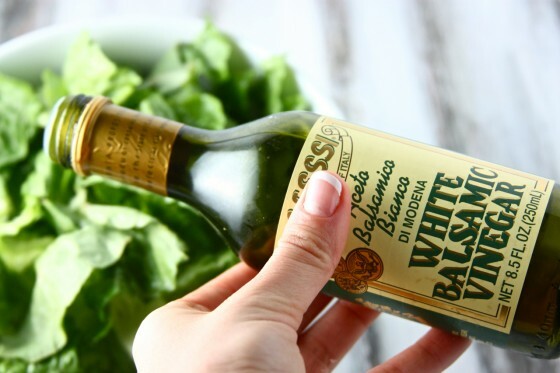 Then, SECRET INGREDIENT!, drizzle lettuce with white balsamic vinegar. 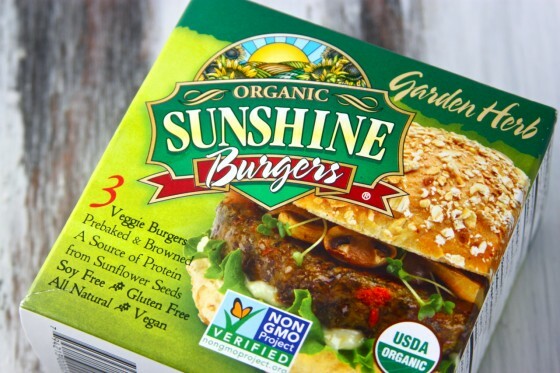 Zap a sunshine burger (or any veggie burger) in the microwave for a minute. And while that’s cooking, get tahini out of the fridge. Man, I love tahini…so much more than hummus! Especially this one from Trader Joe’s. 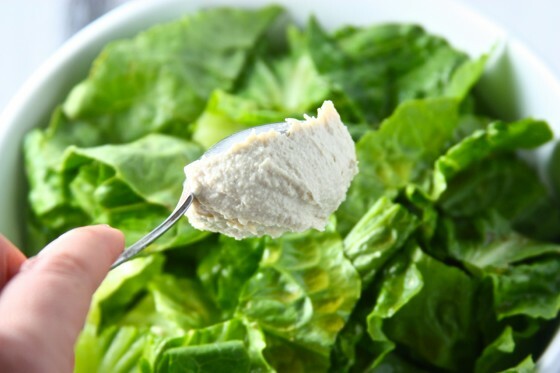 Scoop a big ol’ spoonful of it on your white balsamicy greens…. And then crumble your veggie burger on top! Now, take a ridiculous amount of goat cheese (or feta) and toss it on top. You can never overdo this part. Get crazy! And……squirt sriracha generously over everything! 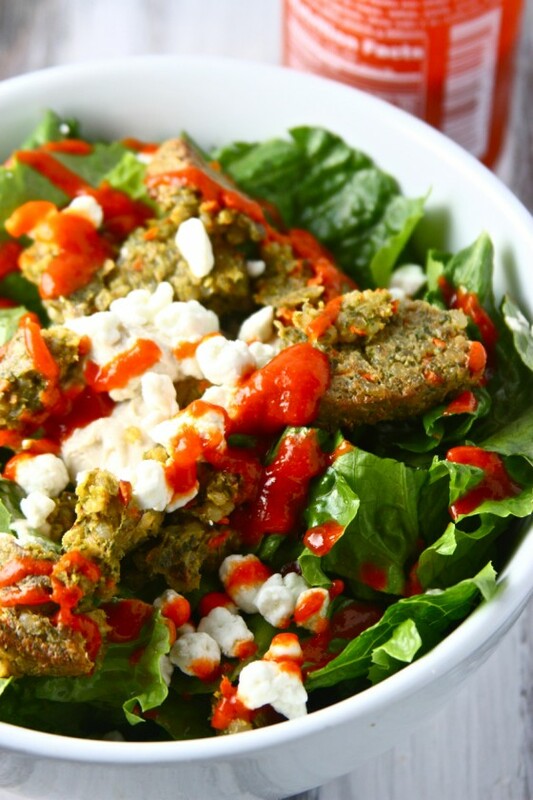 This salad is nothing without sriracha. 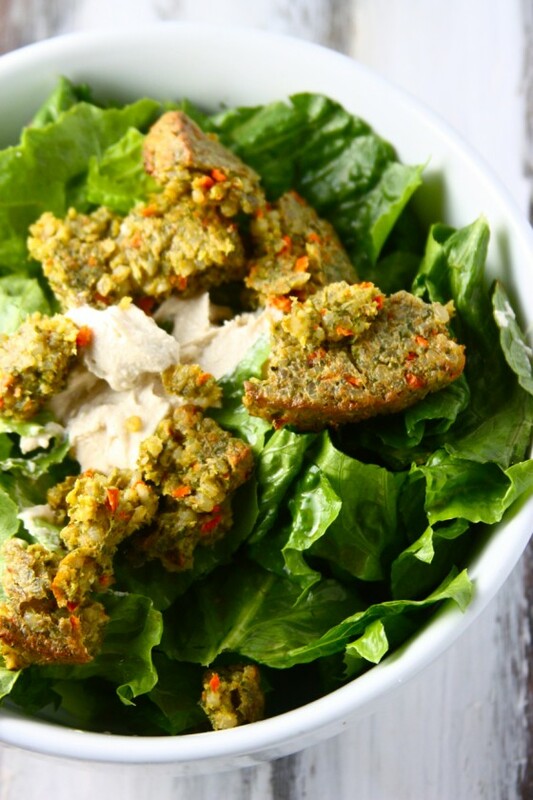 It combines perfectly with the tahini sauce and is ridiculously addicting. Don’t say I didn’t warn ya. There you have it! Let me know how you like it…I can’t get enough! I always finish my meal with (unpictured) chocolate and it keeps me full all afternoon long. I do something similar with TJ’s veggie masala burgers. You can put those things on anything and it tastes good! I love this idea, but I think I might mix the sriracha with the tahini. I eat it straight on certain things, but for others, I mix with with sour cream. (Try that some time!) It’s delicious on baked potatoes, fried fish (like fish sticks or fish fillets) and burritos, among other things. I think the tahini would “cut” the sriracha in the same way. Even tho this doesn’t look like a salad I would eat, it is so wonderful to see a vegetable! lol I am ready for fruit and vegetables! I’ve never thought of using plain tahini or sriracha on salad! But I am sorely in need of a salad after all the rich Christmas food. This looks delicious. Enjoy your travels and time with your family! This look sooo good. When I saw the picture I thought that you had put Falafels on your salad. Oh, I bet that would be so good on their. Probably not as healthy though unless you bake them. Thanks for the recipe I can’t wait to give it a try. I could use a little salad in my life right now. Sounds incredible, I love tahini drizzled over just about anything. My tahini is much more liquidy than your appears. I could use a hugh jass salad right about now too! This is just what I need after eating my face off this holiday! Mmm … I love simple “cooking” for 1 recipes. Throw in goat cheese and I’m sold!!! Yuuuuummmm. Looks amazing. Can’t wait to try it! 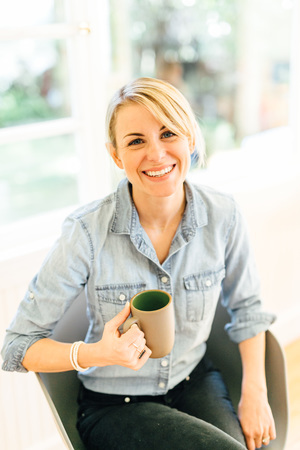 I remember your lunch posts back when you first moved to California: you made me fall in love with veggie burgers and hummus on my salads. 😀 Merry Christmas, Jenna! Enjoy your vacation! I made a small batch of these today. I am just learning how to bake and they are delicious. They are so soft and easy to make. 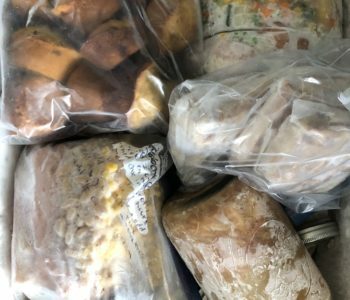 I am wondering, what would be a good substitute for amaranth flour? I have teff, brown rice, millet, and chickpeas flour. Also, can I omit baking powder or substitute with something else? I am just not sure how my son will react to baking powder. I was with you, until you added the cheese. 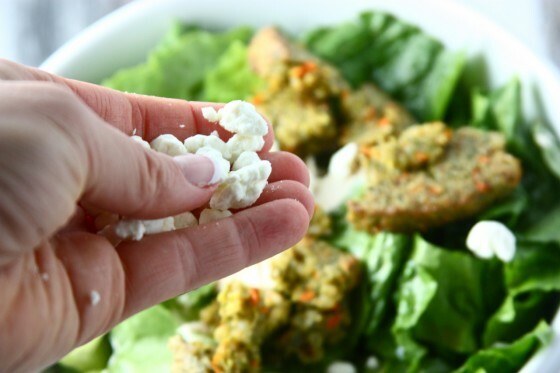 I know I know, I’m crazy … but I’m not a big fan of goat cheese or feta. But I bet it would still be yummy without the cheese! Enjoy Texas! I’m having this salad for lunch with one of the Trader Joe’s Indian flavored veggie burgers. This looks like a great salad! I’m sorry, you may have already answered this- or you may not want to say online- but being from Texas, my curiosity has finally got the better of me- where in Texas is Adam from? I’m currently reading a book that makes me think of your blog. It’s called “The Wilder Life: My Adventures in the Lost World of Little House on the Prairie.” I think you would enjoy it. Merry Christmas! 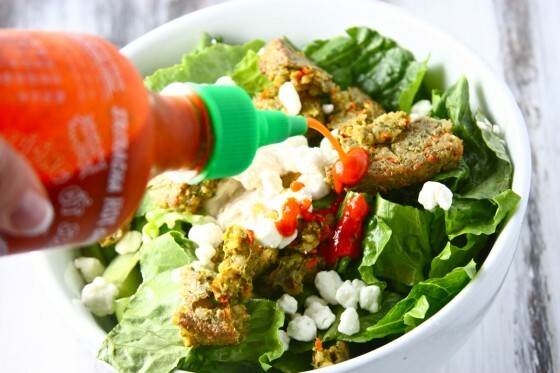 I love Sriracha, but I’ve never thought to use it in a salad. That’s all that is on the menu for me. Salad. Salad. Salad. My kind of lunch or dinner. What is wrong with CO that we don’t have a Trader Joe’s??? You definitely read my mind with this post. It is DEFINITELY time for salad! You have NOOO idea how amazing it is that you put this salad up here! I literally eat almost the exact same thing three times a week! I thought I was the only one into that Tahini!!!! Yum! This looks really good and simple. Quick thing: it’s “per se” not “per say.” Sorry, I’m a grammar/spelling nut! Great salad combo! I love sunshine burgers and their teeny tiny ingredient list! 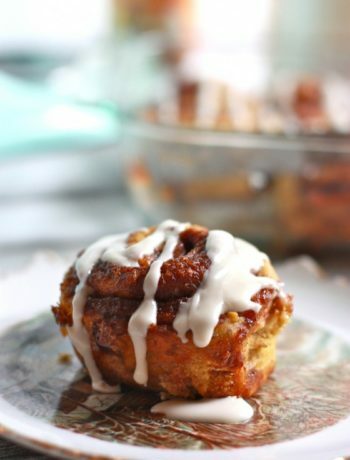 This is different than a typical recipe post, but I really liked it! It’s something I’ll actually make, like tomorrow. Thanks!! Enjoy East Texas! This looks delicious! I have most of these ingredients, so I’ll try it today. Thanks, Jenna! I hope you had a great holiday! That is my kind of salad. thank you so much for posting this! i love all of your recipes, but i especially love something so easy and quick to do! what a wonderful flashback to your old school blog days. I love when you share the healthy side of your life-we know you have great balance and hope to see more healthy recipies in the new year!!! You’ve finally convinced me to try veggie burgers. The thought of eating them as a ‘burger’ never appealed to me but crumbled on a salad sounds yummy. I don’t eat meat or chicken so I’m looking forward to trying something new…Thanks Jenna! 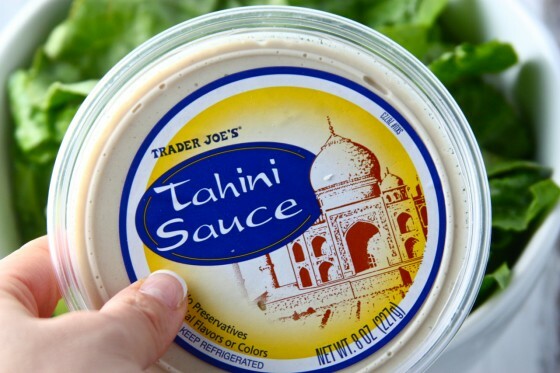 I love Trader Joe’s tahini sauce! Great idea for a salad! 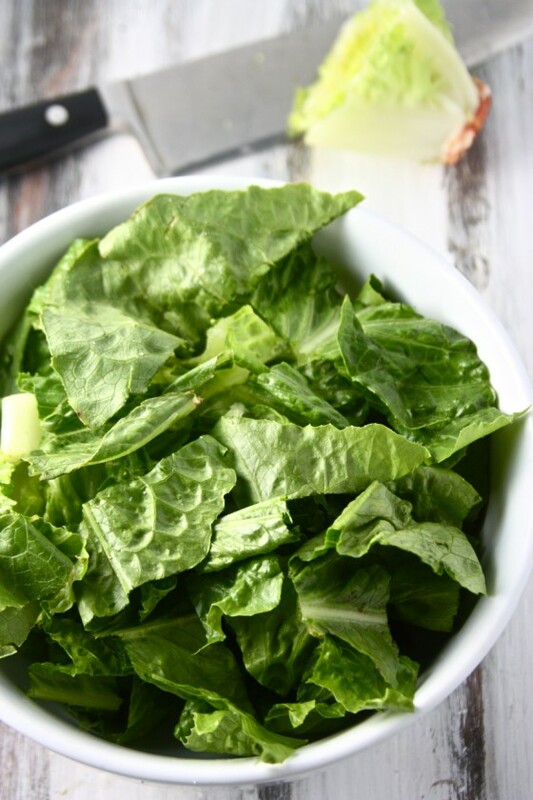 This salad has become my go to salad for lunch or a light dinner! Thanks so much for sharing. I would have never thought to put this combo together, it so good! I’m on my second day of eating this salad. I’m obsessed!! I love that it’s filling, but doesn’t weigh me down. Thanks!!! This looks like my kind of salad! I’m making it tonight. It’s perfect for my “after the holidays detox” diet! I have NEVER tried sriracha – so wish me luck! I tried this out last night and it was delicious! It’s not a combo I had thought of, and a great break from my usual (boring) salads. I’ve been making this salad for lunch this week and I LOVE it! Thanks for providing an easy, healthy lunch solution. Okay…finally tried this…love it! But what on earth made you put this combination together? because it was all I had in my kitchen at the time so I just threw it together and it tasted amazing! Thanks so much for presenting Sunshine Burgers with such style. And your white balsamic, tahini, sriracha dressing was inspired. I’m going to bottle some of that and keep it handy! Just made this salad and I loooove it!! I added some baby heirloom tomatoes and shredded carrots too. Love these simple recipes for one person. Thanks a lot! Just had this salad for dinner, and it was delicious. My lips are tingling with siracha happiness. Thanks for sharing! 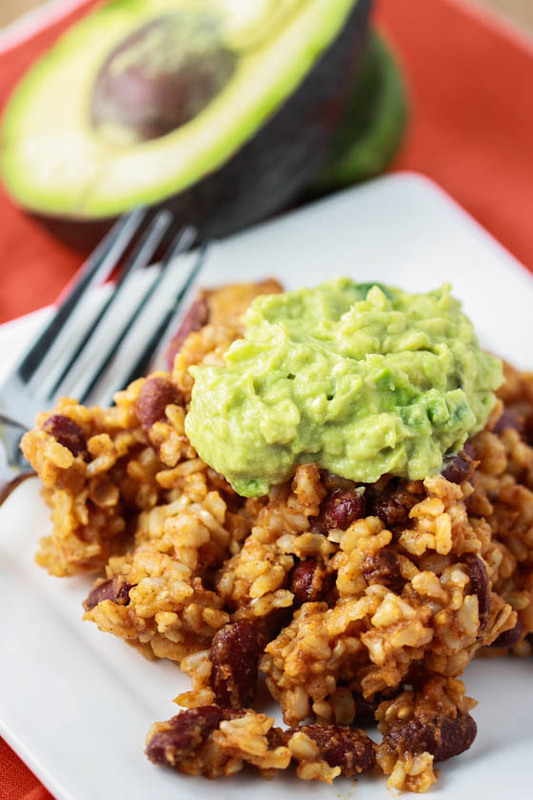 I made this with grilled chicken and added avocado instead of the veggie burger – delicious!!! great combo! This has definitely become my favorite salad! It lights my mouth on fire every time and I LOVE it. I’d highly recommend making it with Emily’s chickpea hummus burger from Daily Garnish! I consistently make this now .. for months! I’ve tried this salad twice and LOVE it. It got my attention as soon as you mentioned tahini. I also prefer it much more than hummus. It is decadently delicious and so good to know everything in it keeps my body humming. thank you! !